Today is Altenew Build-A-Flower product of the month mini-release. 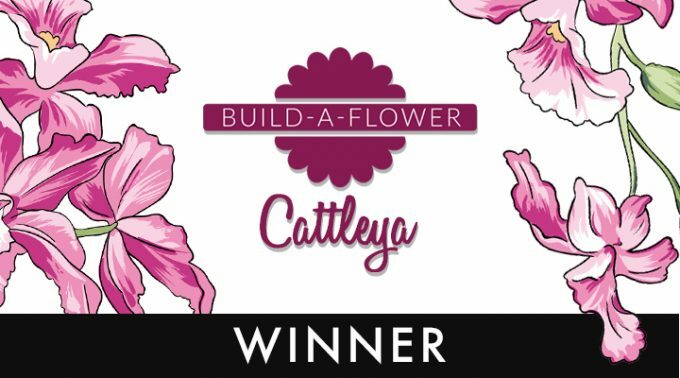 This month it’s Build-A-Flower: Cattleya. I made two very simple cards using this set. Both have a similar design. 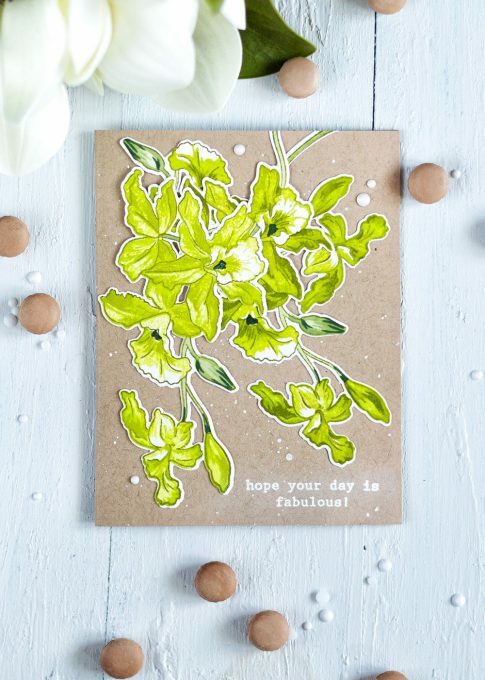 Plain card base made out of a Parchment Cardstock with random splatters of the Pure White Ink Spray, white embossed sentiment and colorful Cattleya Orchid as the main element. Snow crystals also as finishing touches. The first card is extremely simple. 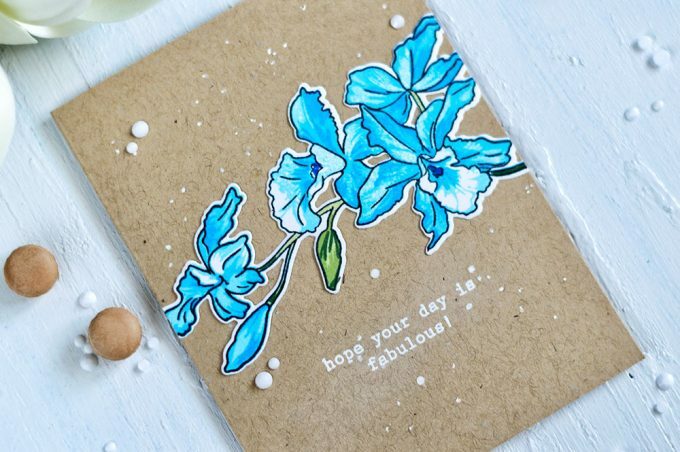 I stamped one Cattleya Pick using Sea Breeze, Turquoise and Tide Blue Inks for flowers, Frayed Leaf, Forest Glades and Evergreen for leaves. Next it was die-cut using the matching die and adhered onto the card base across its width. The second card is a bit more complicated. Simply because I had to stamp tree picks and then assemble them on a card. 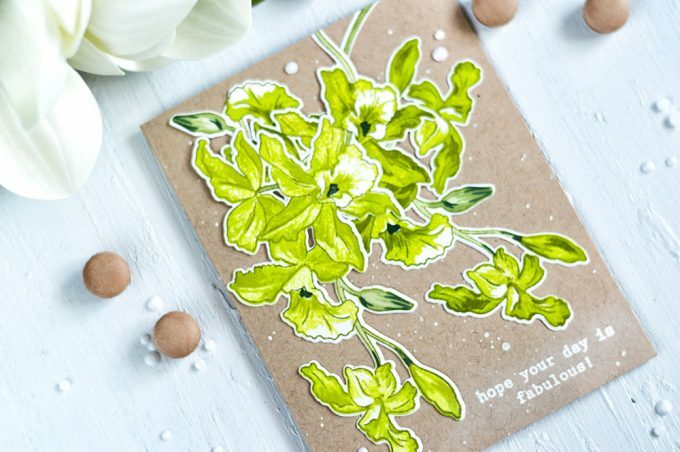 Two elements were stamped using Parrot, Olive and Moss Inks (for the flower parts, leaves were stamped using the same colors as in the previous card). One cattleya, which I placed on the very top, I made a bit lighter by stamping it with Bamboo, Parrot and Olive Inks. I adhered two picks (one darker and the lighter one) onto the card. Then I cut another darker cattleya into pieces and used them to fill up the design. The cards turned out to be very simple, but I really like this simplicity. And I really like the neutral palette with some pop of bright color. To celebrate this release, Altenew is giving away a $30 gift certificate to six lucky winners! Please leave a comment on the Altenew Card Blog and/or Altenew Scrapbook Blog for a chance to win. Three winners will be announced on the Card Blog, and other three winners will be announced on the Scrapbook Blog on 8/8/2018. I will also randomly choose a winner from comments left on this post and the prize will be $20 gift certificate to Altenew online store. Please leave a comment on this post by 8/4/2018 for a chance to win. I will announce the winner here on this post on 8/5/2018 as well as on the winners page. The winner of $20 Gift Certificate is Cindy Holmes. Gorgeous cards! I love the colors! 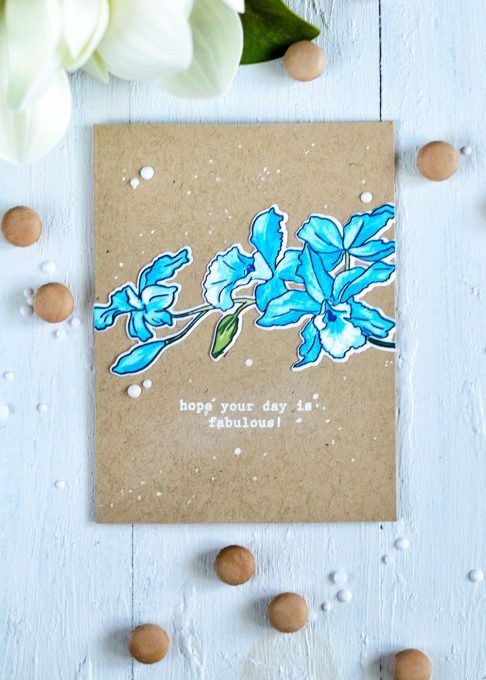 Beautiful cards using pretty flowers! I love how the flower colors really stand out against the parchment colored paper and the snow crystals are the perfect touch, I love them! These are both so very lovely. Colored beautifully. Love your beautiful cards. Glad you used the kraft – my favorite. Lovely colors over Kraft paper. Very cool ideas! I love the new flower set! I’m in love with this cattleya floral. It’s so unique. Would love to see in real life. I’m crazy about the colors you used on tan cardstock. Just lovely. Love both cards, but am partial to the one with the beautiful greens. GORGEOUS CARDS! The colors are just fantastic on each card! I really love that you put the flowers on Parchment paper! I also love the random splatters on each card! It just really finishes them off so nicely!! Gorgeous cards! The colors are so wonderfully vibrant against the craft cardstock. The green is especially striking. Such gorgeous cards! Gorgeous colors and details! Love this new BAF set! Just Beautiful, Love the colors you choose, gorgeous!!! 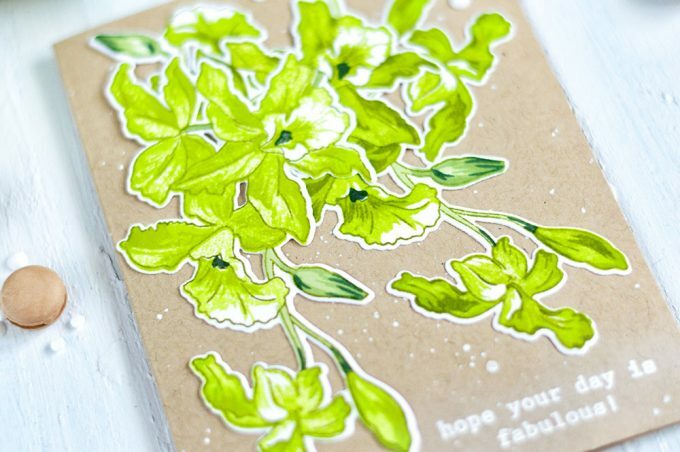 I love the cardstock you used, the look is so pretty. Thanks for a beautiful post. As always Svitlana your cards are awesome. I love the ‘kraft’ cs with the colours you chose for the Cattleya. So striking. 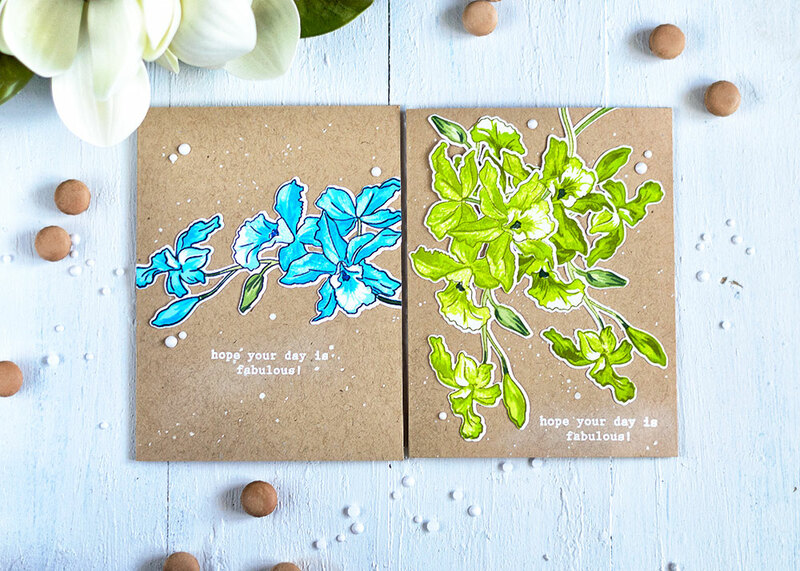 LOVE your gorgeous CAS cards, both designs are so fluid and really showcase these beautiful new BAF blooms! Awesome ink colors on the parchment with white spatter and crystal details, and love the top bouquet in lighter greens to give more dimension, brilliant! Love your creative color scheme! Beautiful cards! Your flowers contrast well with the kraft, too. Thanks for the inspiration! Love the colors on both cards! These cards are lovely, LOVE that green!!! Such beautiful cards! I love your designs and the colours you used are fantastic! Beautiful colors and I like the kraft background. Such a gorgeous new floral set! I love your cards, especially that second card with the greens, so pretty! Absolutely Elegant cards! The Kraft background are so amazing with the colors you choose. . Thanks for the inspiration. Какие цветы интереные!!! Открытки оригинальные, особенно понравилась голубая!!! WOW, how stunning are these ! 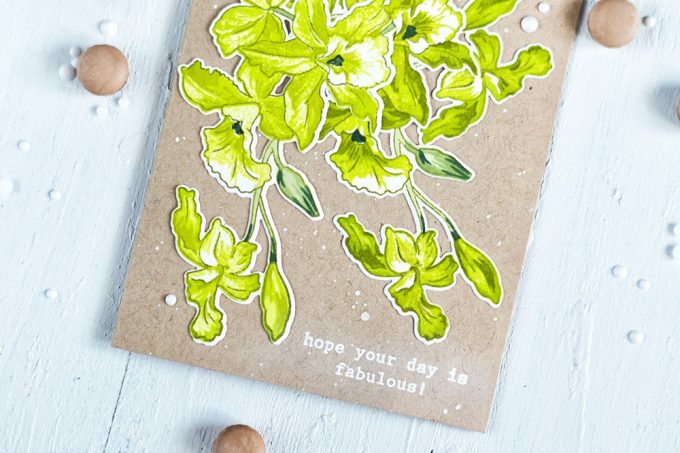 Simple but absolutely gorgeous in colours, layout & sentiments. Thank you so much for showing these. See, to me, this is how to show off the new images!! Different colors than what the set comes with and shading even with the same inks to have darker and lighter versions! Really showcases the Cattleya orchids in their natural colors with the Parrot greens especially! Gorgeous cards! Elegant and graceful is a good way to describe this beautiful flower. Love the pretty inspiration! I don’t think I’ve ever seen the tropical greens as flowers against the green fields colors. I’m surprised at how nicely they work; I would have thought they would clash, but these look amazing. I love this CAS look; it’s so elegant and the parchment cardstock really allows the flowers to shine. Thanks for sharing! Svitlana, these are beautiful cards. This is such a delicate flower. I especially love the blue flower. Your coloring and blending is amazing! this new BAF is so pretty and using it on a kraft background highlights it so beautifully! Beautiful cards! 🙂 I love how the colors stand out on the craft cardstock.